Truly AMAZING home in Lithia with a huge detached WORKSHOP that houses a Kubota B3030 Tractor INCLUDED in the price and an entire APARTMENT above the workshop. 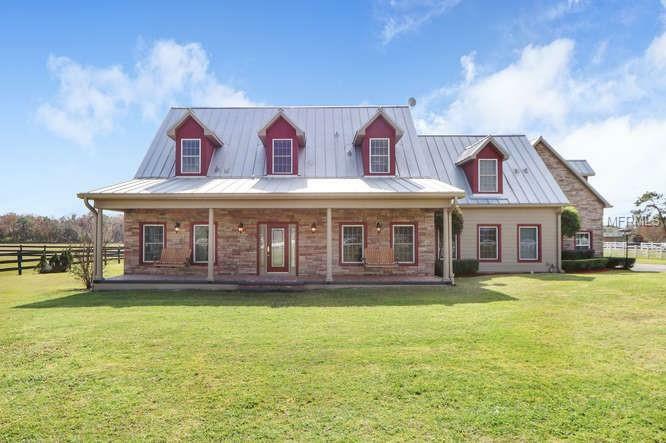 **Tractor and Storage Shed**All Pastures Fully Irrigated**20X20 Tack Room**3 Rail Fence Throughout Property**Minutes From Trail Head**The long Private Driveway leads you home to this 4 Bedroom 3.5 bathroom one of a kind find. Take a right upstairs as you enter the front door to the Game Room complete with a Pool Table, fully functioning bar, and a private deck overlooking the acres of green grass. The Kitchen is complete with updated appliances and a Beautiful COPPER SINK. Kitchen also has a BONUS Butlerâs Pantry with a wine fridge and a custom-built wood pantry. Formal Living and Dining Room plus a spacious Family room. Master bedroom is located downstairs, it has an entrance to the POOL and a separate AC unit. Upstairs you have your extra Bedrooms and a spacious hardwood floor Landing overlooking the first floor and pool. But wait thereâs more! The workshop out back not only has plenty of space but is air conditioned and has a bathroom. The back of the Workshop is connected to the horse stalls, used for miniature horses but easily converted to regular size stalls. Not done yet because above the workshop there is an APARTMENT with 2 Bedrooms, full Bathroom, Kitchen and washer and dryer Hookups. This is a MUST SEE! Make an appointment TODAY!